When backup some old DVDs, my DVD decrypter only can reach 75% and cannot go ahead any longer due to the bad cluster errors on DVD. How could I fix DVD with unreadable sector or Is any better ripping tool I can choose? I has some brand new DVDs and when I tried to make digital copies (for legal use, I own them), I keep getting told the sectors are bad. why? Is there any solution to copy DVD with bad sector? What Caused Bad Sectors on DVD? Bad sectors, as the name suggests, are parts of a disk that cannot be used and read. Generally, bad sectors on DVD include both natural and artificial bad clusters. 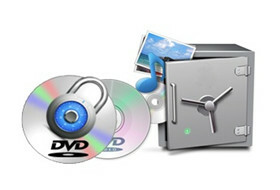 To be specific, the natural bad DVD sector is caused by physical damage like severe scratches, while the artificial bad cluster arises from certain man-made measure that is purposely embedded into the DVDs as a form of copy protection, like Sony SRccOS, which could prevent DVD player from access and make some common DVD copy software stumbled during DVD copy. Bothered by the corrupted sector error when copying DVD? Want to know how to repair bad sector error on DVD and copy damaged DVD smoothly? Take it easy. If you suffer from the unwriteable sector error during DVD backup, you could check whether your DVD disc is intact first. If the DVD is scratched, you can wipe it with a microfiber cloth or clean it with rubbing alcohol, window cleaner or a DVD cleaning kit. If nothing changed after that, it shows that bad cluster error stems from the copy protection embedded, and then you have to find some other DVD copy software for help. Actually, to backup DVD with damaged sector would be an easy task if you have a right DVD digitalizing software like MacX DVD Ripper Pro, which can rip DVD with unreadable sector easily and fix bad sector on DVD during backup process. If the inaccessible or unwriteable sector is irreparable, it would automatically skip the unusable part to guarantee smooth DVD playback afterwards. More strikingly, this solid DVD decrypter software can bypass any DVD protection measures put by the film publishers effortlessly, no matter the Sony ARccOS protection , Disney protection, region code or general CSS. Below is the tutorial about how to copy a DVD on a Mac. Free download, install and run this DVD copy software on Mac and import the DVD you want to backup by hitting "DVD Disc" button or "DVD Path" button. PS: For Windows user, you can head over to the Windows DVD copy software to rip DVD with bad sector on your PC. 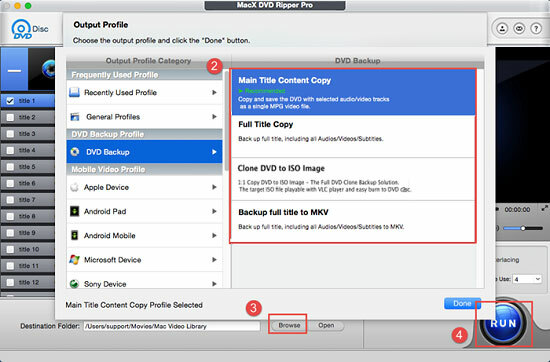 In the automatically pop-up profile window, directly go to "DVD Backup" column and choose one DVD backup model. There are four DVD backup modes provided: copy main title content, full title, DVD to ISO image and backup DVD to MKV video. To perfectly clone DVD with bad sector, it is suggested to choose "clone DVD to ISO image" here, so that you can burn the copied content to a new blank DVD. 1. The "CPU Core Use" option on the main interface enables you to make full use of CPU so as to copy DVD with bad sector more quickly. 2. You can also choose "Use High Quality Engine" or set "Deinterlacing" to make the video quality of the copied movie as good as the original. Thus, the output DVD movie quality is even higher than the one produced by DVD video recorder. Step 4: Start copying DVD with Bad Sector. Click "RUN" to start to backup DVD with damaged sector on your Mac computer. You can also view the conversion progress and are able to cancel the converting process at anytime. More than a professional DVD copy software, MacX DVD Ripper Pro is also able to rip CPRM protected DVDs, AV Japanese DVDs, workout DVDs, yoga meditation DVDs, Lionsgate DVDs, etc. with stable performance and original quality at full speed.